This paper introduces high-speed vision the authors developed, together with its applications. Architecture and development examples of high-speed vision are shown first in the sections that follow, then target tracking using active vision is explained. High-speed vision applied to robot control, design guidelines, and the development system for a high-speed robot are then introduced as examples. High-speed robot tasks, including dynamic manipulation and handling of soft objects, are explained and then book flipping scanning – an image analysis application – is explained followed by 1 ms auto pan/tilt and micro visual feedback, which are optical applications. T. Senoo, Y. Yamakawa, Y. Watanabe, <. Oku, and M. Ishikawa, “High-Speed Vision and its Application Systems,” J. Robot. Mechatron., Vol.26, No.3, pp. 287-301, 2014. M. Ishikawa, A. Morita, and N. Takayanagi, “High Speed Vision System Using Massively Parallel Processing,” 1992 IEEE/RSJ Int. Conf. on Intelligent Robots and Systems, pp. 373-377, 1992. T. Komuro, S. Kagami, and M. Ishikawa, “A Dynamically Reconfigurable SIMD Processor for a Vision Chip,” IEEE J. of Solid-State Circuits, Vol.39, No.1, pp. 265-268, 2004. T. Komuro, I. Ishii, M. Ishikawa, and A. Yoshida, “A Digital Vision Chip Specialized for High-speed Target Tracking,” IEEE Trans. on Electron Devices, Vol.50, No.1, pp. 191-199, 2003. T. Komuro, A. Iwashita, and M. Ishikawa, “A QVGA-size Pixelparallel Image Processor for 1,000-fps Vision,” IEEE Micro, Vol.29, No.6, pp. 58-67, 2009. Y. Nakabo, M. Ishikawa, H. Toyoda, and S. Mizuno, “1ms Column Parallel Vision System and Its Application of High Speed Target Tracking,” Proc. of IEEE Int. Conf. Robotics and Automation, pp. 650-655, 2000. T. Komuro, T. Tabata, and M. Ishikawa, “A Reconfigurable Embedded System for 1000 f/s Real-Time Vision,” IEEE Trans. on Circuits and Systems for Video Technology, Vol.20, No.4, pp. 496-504, 2010. I. Ishii, T. Tatebe, Q. Gu, Y. Moriue, T. Takaki, and K. Tajima, “2000 fps Real-time Vision System with High-frame-rate Video Recording,” Proc. of the 2010 IEEE Int. Conf. on Robotics and Automation, pp. 1536-1541, 2010. Y. Watanabe, T. Komuro, and M. Ishikawa, “A High-speed Vision System forMoment-based Analysis of Numerous Objects,” Proc. of IEEE Int. Conf. on Image Processing, pp. V177-V180, 2007. I. Ishii, Y. Nakabo, and M. Ishikawa, “Target Tracking Algorithm for 1ms Visual Feedback System Using Massively Parallel Processing,” Proc. of IEEE Int. Conf. Robotics and Automation, pp. 2309-2314, 1996. Y. Watanabe, T. Komuro, S. Kagami, and M. Ishikawa, “Multi-Target Tracking Using a Vision Chip and its Applications to Real-Time Visual Measurement,” J. of Robotics and Mechatronics, Vol.17, No.2 , pp. 121-129, 2005. Y. Watanabe, T. Komuro, and M. Ishikawa, “A High-speed Vision System for Moment-based Analysis of Numerous Objects,” Proc. of IEEE Int. Conf. on Image Processing, pp. V177-V180, 2007. Y. Watanabe, T. Komuro, and M. Ishikawa, “955-fps Real-Time Shape Measurement of a Moving/Deforming Object Using High-Speed Vision for Numerous-Point Analysis,” Proc. of IEEE Int. Conf. on Robotics and Automation, pp. 3192-3197, 2007. A. Namiki, T. Komuro, and M. Ishikawa, “High Speed Sensory-Motor Fusion Based on Dynamics,” Proc. IEEE, Vol.90, No.7, pp. 1178-1187, 2002. A. Namiki, Y. Imai, M. Ishikawa, and M. Kaneko, “Development of a High-speed Multifingered Hand System and Its Application to Catching,” Proc. 2003 IEEE/RSJ Int. Conf. Intelligent Robots and Systems, pp. 2666-2671, 2003. M. Ishikawa and M. Shimojo, “A Method for Measuring the Center Position of a Two Dimensional Distributed Load Using Pressure-Conductive Rubber,” Trans. The Society of Instrument and Control Engineers, Vol.18, No.7, pp. 730-735, 1982 (in Japanese). S. Teshigawara, T. Tsutsumi, Y. Suzuki, and M. Shimojo, “High Speed and High Sensitivity Slip Sensor for Dexterous Grasping,” J. of Robotics and Mechatronics, Vol.24, No.2, pp. 298-310, 2012. 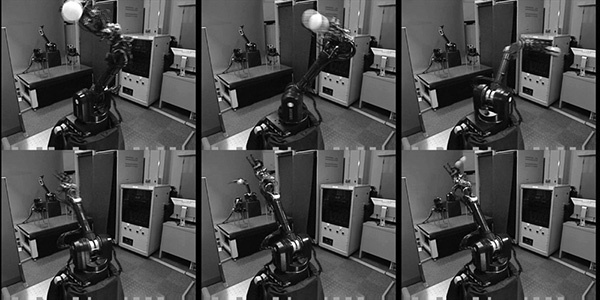 T. Senoo, A. Namiki, and M. Ishikawa, “High-Speed Batting Using a Multi-Jointed Manipulator,” Proc. of IEEE Int. Conf. on Robotics and Automation, pp. 1191-1196, 2004. T. Senoo, A. Namiki, and M. Ishikawa, “High-speed Throwing Motion Based on Kinetic Chain Approach,” Proc. of IEEE/RSJ Int. Conf. on Intelligent Robots and Systems, pp. 3206-3211, 2008. T. Senoo, A. Namiki, and M. Ishikawa, “Ball Control in High-Speed Batting Motion using Hybrid Trajectory Generator,” Proc. of IEEE Int. Conf. on Robotics and Automation, pp. 1762-1767, 2006. T. Senoo, D. Yoneyama, A. Namiki, and M. Ishikawa, “Tweezers Manipulation Using High-speed Visual Servoing Based on Contact Analysis,” Proc. of IEEE Int. Conf. on Robotics and Biomimetics, pp. 1936-1941, 2011. N. Furukawa, A. Namiki, T. Senoo, and M. Ishikawa, “Dynamic Regrasping Using a High-speed Multifingered Hand and a Highspeed Vision System,” Proc. of IEEE Int. Conf. on Robotics and Automation, pp. 181-187, 2006. Y. Yamakawa, A. Namiki, M. Ishikawa, and M. Shimojo, “Knotting Manipulation of a Flexible Rope Using a High-speed Multifingered Hand and High-speed Visual and Tactile Sensory Feedback,” J. of the Robotics Society of Japan, Vol.27, No.9, pp. 1016-1024, 2009. Y. Yamakawa, A. Namiki, M. Ishikawa, and M. Shimojo, “Knotting Plan based on Synthesis of Manipulation Skills with Consideration of Robot Hand Mechanism and Motion,” J. of the Robotics Society of Japan, Vol.31, No.3, pp. 283-291, 2013. Y. Yamakawa, A. Namiki, and M. Ishikawa, “Dynamic Manipulation of a Flexible Rope using a High-speed Robot Arm,” J. of the Robotics Society of Japan, Vol.31, No.6, pp. 628-638, 2013. Y. Yamakawa, A. Namiki, and M. Ishikawa, “Dynamic Folding of a Cloth using a High-speed Multifingered Hand System,” J. of the Robotics Society of Japan, Vol.30, No.2, pp. 225-232, 2012. J. M. Shepard, M. C. Towner, J. Lei, and P. Abbeel, “Cloth Grasp Point Detection based on Multiple-View Geometric Cues with Application to Robotic Towel Folding,” Proc. 2010 IEEE Int. Conf. on Robotics and Automation, pp. 2308-2315, 2010. T. Nakashima, Y. Watanabe, T. Komuro, and M. Ishikawa, “Book Flipping Scanning,” Adjunct Proc. of 22nd Symposium on User Interface Software and Technology, pp. 79-80, 2009. Y. Watanabe, M. Tamei, M. Yamada, and M. Ishikawa, “Automatic Page Turner Machine for High-Speed Book Digitization,” Proc. of IEEE/RSJ Int. Conf. on Intelligent Robots and Systems, pp. 272-279, 2013. S. Noguchi, M. Tamei, M. Yamada, Y. Watanabe, and M. Ishikawa, “Real-time 3D page tracking and book status recognition for highspeed book digitization based on adaptive capturing,” IEEE Winter Conf. on Applications of Computer Vision, 2013. Y.Watanabe, T. Nakashima, T. Komuro, and M. Ishikawa, “Estimation of Non-rigid Surface Deformation using Developable Surface Model,” Proc. of Int. Conf. on Pattern Recognition, pp. 197-200, 2010. Y. Watanabe, K. Itoyama, M. Yamada, and M. Ishikawa, “Digitization of Deformed Documents using a High-speed Multi-camera Array,” Proc. of Asian Conf. on Computer Vision, pp. 394-407, 2012. H. Shibayama, Y. Watanabe, and M. Ishikawa, “Reconstruction of 3D Surface and Restoration of Flat Document Image from Monocular Image Sequence,” Proc. of Asian Conf. on Computer Vision, pp. 350-364, 2012. K. Okumura, M. Ishii, E. Tatsumi, H. Oku, and M. Ishikawa, “Gaze Matching Capturing for a High-speed Flying Object,” Proc. of Int. Conf. on Instrumentation, Control, Information Technology and System Integration (SICE Annual Conf. 2013), pp. 649-654, 2013. K. Okumura, H. Oku, and M. Ishikawa, “High-Speed Gaze Controller for Millisecond-order Pan/tilt Camera,” 2011 IEEE Int. Conf. on Robotics and Automation, pp. 6186-6191, 2011. H. Oku, I. Ishii, and M. Ishikawa, “A microscopic visual feedback system,” Systems and Computers in Japan, Vol.35, No.13, pp. 71-79, 2004. H. Oku, N. Ogawa, K. Shiba, M. Yoshida, and M. Ishikawa, “How to Track Spermatozoa using High-Speed Visual Feedback,” 30th Annual Int. Conf. of the IEEE Engineering inMedicine and Biology Society (EMBC 2008), pp. 125-128, 2008. H. Oku, N. Ogawa, and M. Ishikawa, “Microorganism Tracking Microscope Using High-Speed Vision System,” Seibutsu Butsuri, Vol.49, No.1, pp. 11-14, 2009 (in Japanese). H. Oku, M. Ishikawa, Theodorus, and K. Hashimoto, “High-speed autofocusing of a cell using diffraction pattern,” Optics Express, Vol.14, No.9, pp. 3952-3960, 2006. S. Makise, H. Oku, and M. Ishikawa, “Serial Algorithm for Highspeed Autofocusing of Cells using Depth From Diffraction (DFDi) Method,” 2008 IEEE Int. Conf. on Robotics and Automation (ICRA 2008), pp. 3124-3129, 2008. H. Oku, H. Kiyokawa, T. Yamano, M. Kikkawa, and M. Ishikawa, “Three-Dimensional Visual Tracking of aMotile Cell in Phase Contrast Microscopy,” Proc. of The 17th Symposium on Sensing via Image Information (SSII2011), pp. IS1-11, 2011. H. W. Smith and E. J. Davison, “Design of Industrial Regulators,” Proc. IEE, No.119, pp. 1210-1216, 1972. [a] Ishikawa laboratory, Web page. [b] Ishikawa laboratory, YouTube channel. [c] Barrett Technology Inc., Web page.